Sit ups are well known, core crunching exercises that build the muscles in your abdomen. You can perform sit ups without equipment, but using a bench will help you take your workout to the next level, improving core strength, stability and honing your muscles to help you look great. If you’re a beginner, benches can help you get started in the safest possible way, decreasing the chance of injury and allowing you to build up your muscle tone. More advanced fitness trainers can use a bench to make their workouts harder by adding gravity to their crunches, pushing through the plateau that can often occur when exercises become too easy. You might want to try some ankle weights if you plan to do leg exercises on your sit up bench, to increase ab workout intensity. These benches are extremely versatile, primarily built for abdominal workouts but with many also allowing you to perform exercises that tone various other muscle groups. The XMark XM-4416.1 is in extremely versatile bench, with its 12 incline options, while remaining strong and stable at each. It’s a great pick for anyone wanting to feel secure while they work their core, and is especially great for anyone with a taller or stockier build. 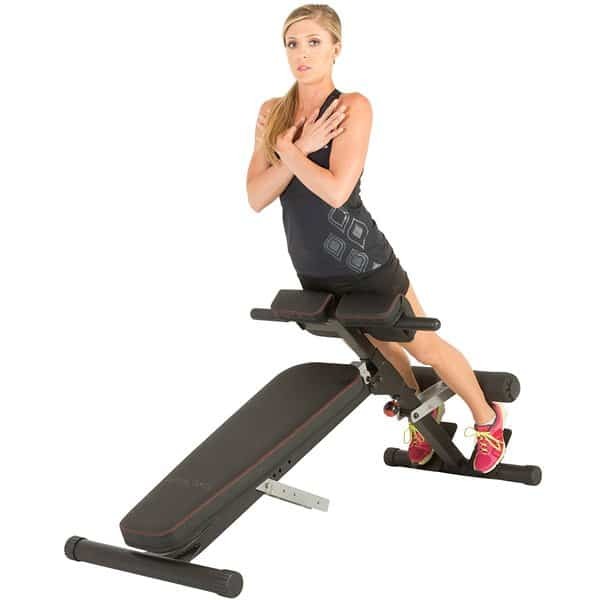 There are 12 options for incline adjustment, which makes the bench very versatile. It can be used by beginners who need a shallower angle or experts who require more gravity, and anyone in between, allowing you to progress through the levels without needing to buy more equipment. Plus, you can experiment with exercises which require different heights. The XM-4416.1 has been constructed with stability in mind, and the sturdy steel frame makes you feel well supported during all your exercises. True to its name, the machine is ergonomic too. The leg rollers are strategically placed to help reduce back strain, and the thick cushion of the padded bench provides extra comfort. The support handles, which are located at the foot of the bench, make it much easier to get on and off when you’re trying exercises that require a steep angle. The bench is long and wide, so can comfortably accommodate taller, broader frames. The sturdy construction and length of the bench means it has a large footprint, so you would need a lot of space to use and store it. The bench doesn’t go completely flat and so can only be used for inclined ab exercises rather than doubling as a weights bench. If you’re looking for a rowing machine or dip station to go with your sit up bench, check out our reviews. The Universal UB100 bench is cost effective, and would be a great purchase for a small build beginner or casual user who wants a bench that is easy to store, easy to put together and reasonably versatile. The UB100 bench is small, light and easy to assemble. It also folds away for compact storage. The bench is comfortable, with a thick, cushion covering it, and the foam rollers providing stable, padded support for your legs. 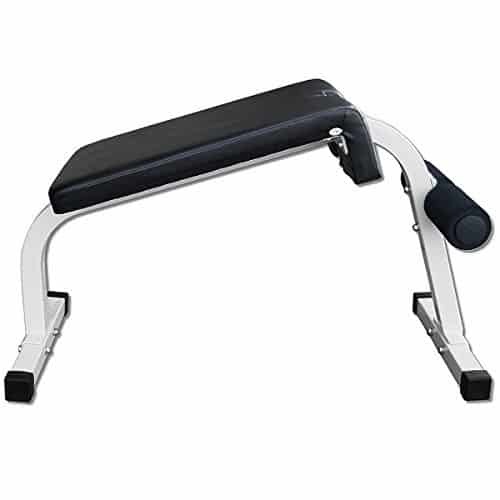 It is reasonably versatile, allowing you to easily perform sit ups or twists and giving a couple of options for increased angle. With a 200 lb max weight, this bench is only really suitable for those on the smaller side, and can wobble if used by someone heavier. The bench is also quite short in length, so would be unsuitable for anyone over 6’ as their head may hang off the end of the bench. Previously sold under the name Ironman Fitness, the Fitness Reality X-Class bench is a truly versatile, sturdy piece of equipment for anyone wanting to use a bench for more than just ab exercises. It’s highly adjustable and sweat resistant. Almost everything about the X-Class bench is adjustable, meaning you can tailor your whole setup for maximum comfort. Plus, the bench can be easily shared by users who have different body shapes, so it’s great for couples or families who would all like use the equipment. The bench can be used for exercises which target multiple muscles groups as well as just abs, making it a great, full body piece of equipment. For example, it can double as a weights bench, given the fact it can be flattened; it can be used for back extension exercises; and you can use it to work your legs and lower body too. It has wheels for easy transportation and storage, and has a reasonably small footprint. The max weight it can hold is 650 lb, which is great, but the bench isn’t suitable for anyone over 6’4” in height. Some customers have reported problems with parts when the bench first arrived, or have had issues with breakages and/or the packaging it was delivered in. This Body-Solid bench wins when it comes to versatility and stability, with its 12 height options and sturdy construction. It’s suitable for use at home or in commercial gyms, so anyone purchasing it can be assured of its quality. The 12 height options of the Pro-Style Ab Board range from shallow angles to practically vertical. 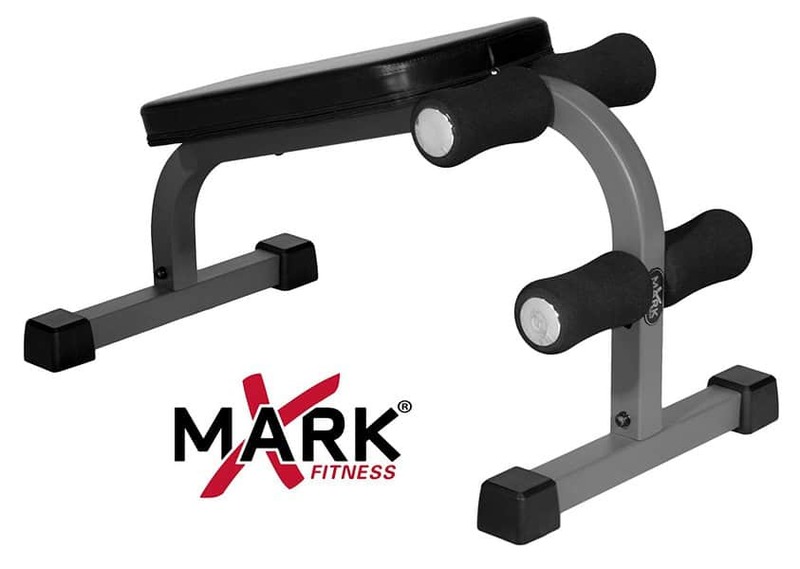 As with the XMark XM-4416, this bench will challenge beginners and experts alike. The bench itself is extra-wide, giving an enhanced feeling of stability and support. The rollers are well positioned for stability at the ankle and knee, and their thickness makes for comfortable use. Unfortunately, the Pro-Style Ab Board is a fairly short bench and so is unsuitable for anyone over around 5’10” to use. Some users have found the bench difficult to assemble. The Deltech Sit Up Bench is a small, effective and sturdy bench that has been specifically designed for sit ups. 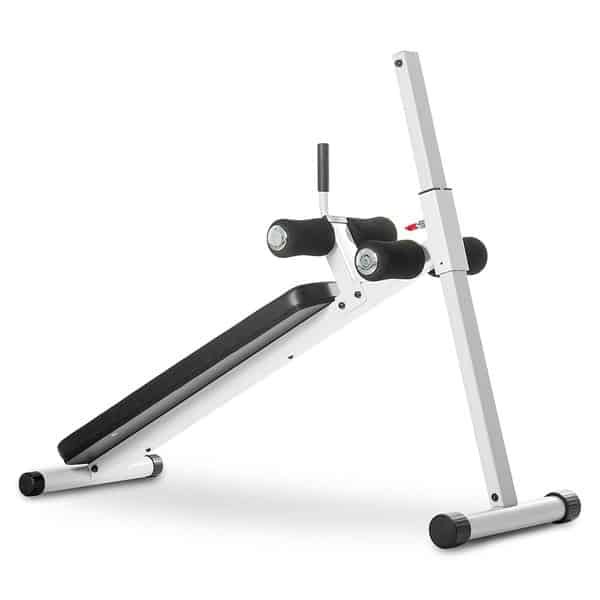 What it lacks in versatility it makes up for in construction, and would be an ideal addition to a home gym, or a great stand alone piece for someone with limited space who wants to work their core. The Sit Up Bench is designed to encourage proper form when performing sit ups, and so allows users to minimise the chance of hyper extending or putting too much pressure on their back. The bench is robust and well made, providing excellent support and stability. Despite being sturdy, the bench is quite small and so is ideal for those with limited space. It can also be used for Roman Chair exercises. Unlike some of the other ab benches we have looked at, the Deltech Sit Up Bench isn’t height adjustable and so can only be used for sit ups. If you’re looking for a more versatile piece of equipment, this bench isn’t for you. The rollers aren’t height adjustable, so users with longer legs may find they are poorly positioned. 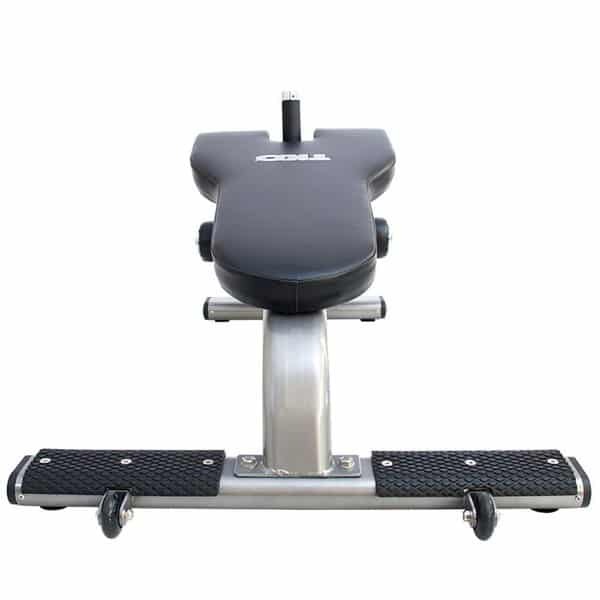 Similar to the Deltech Sit Up Bench, the XMark Mini XM-4415 is a compact, sturdy, non-adjustable bench which can be used to perfect sit ups. It is a cost effective and easy to store option which doesn’t compromise on quality of build. Modelled as a mini version of the XMark XM-4416 Ab Bench, the XM-4415 puts comfort and ergonomic support first. The two sets of rollers are fairly unique to benches this small, and allow maximum stability for knees and ankles during exercises. Well built, with protective caps on the feet that stop the bench from moving around during exercise. It doesn’t take up a lot of space, and is quite light (despite its durability) so it can be easily moved around. It isn’t as versatile as some of the other, adjustable ab benches, as the fixed height only allows for sit ups. Some taller users have found the knee and ankle rollers uncomfortable, and as they aren’t adjustable they can’t be moved into a better position. The TKO Sit-Up Bench boasts a fixed angle that is perfect for beginners, along with a compact design and easy mobility. It would be a good addition for anyone just starting with ab exercises, but is unlikely to be suitable for those looking for a more challenging workout. As with other fixed height benches, the TKO bench is small, easy to use and easy to store, especially if you’re tight on space. The 23 degree angle provides a great workout for beginners looking to improve their sit up form and core strength. The handle is a welcome addition, making it easier to get on and off the bench during use. The fixed height and angle of bench are only really suitable for beginners rather than experts who train often. To achieve the shallower angle, TKO have built the bench so it sits very close to the ground. 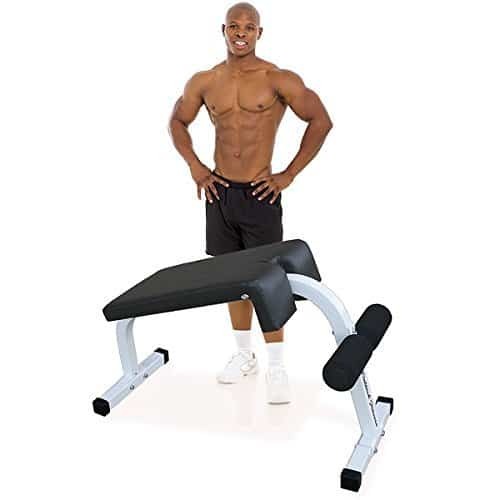 For taller users this can be uncomfortable, and coupled with the fact that the bench itself is quite short, means the TKO Sit-Up bench isn’t really suitable for anyone over around 6’.